CD200 and CD200R: A Ligand Receptor Pair Important in Regulating Macrophage Activity. CD200 antigen, originally named OX-2, is a type I transmembrane protein belonging to the Ig superfamily. It contains one Ig-like C-type and one Ig-like V-type domain. Two length variants found in human and mouse have been described. CD200 is expressed on thymocytes, B cells, activated T cells, splenic follicular dendritic and endothelial cells, as well as subsets of T cells, activated B lymphocytes, and dendritic cells and finally neurons. 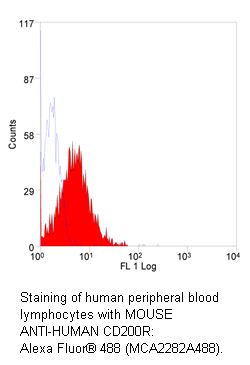 Bio-Rad produces antibodies against CD200 for staining human, mouse, and rat samples. Anti human CD200 (MCA1960, clone OX-104) is available in the following formats: purified, Biotin, FITC, RPE, ALEXA FLUOR® 647, azide free for functional studies. Clone OX-104 is suitable for flow cytometry and histology staining on frozen sections. 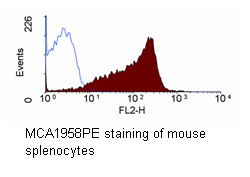 Mouse specific CD200 antibody (MCA1958, clone OX-90) can be obtained as a Biotin, FITC, or RPE conjugate; purified and azide free formats are also available. Antibodies from clone OX-90 can be used in flow, ELISA, and on frozen sections. Anti rat CD200 (MCA44, clone OX-2) can purchased from Bio-Rad in azide free or purified form, and has been conjugated to FITC and RPE. In addition to flow and staining of frozen sections, OX2 can be used to immunoprecipitate rat CD200. To complement our product specific for CD200, Bio-Rad produces antibodies recognizing the receptor for CD200, CD200R. CD200R is mainly expressed on mast cells, basophils, macrophages, and dendritic cells. Like CD200 It also has two Ig-like domains. Antibodies to human CD200R (MCA2282, clone OX108) are manufactured in a comprehensive range of formats for flow cytometry applications: purified, Biotin, FITC, RPE, Alexa Fluor ® 488 and Alexa Fluor® 647. Anti mouse CD200R (MCA2281, clone OX-110) has been conjugated to Biotin, FITC, RPE, Alexa Fluor® 488 and Alexa Fluor ® 647. Purified and low endotoxin formats are also available. All these are certified for flow cytometry. Rat specific CD200R (MCA1959, clone OX-102) is available in the following formats: purified, Biotin, FITC, and RPE. For functional studies on rat CD200R an azide free and a low endotoxin version can be obtained from Bio-Rad. Clone OX-102 produces antibodies that can be used in flow, functional studies, Western blotting, immunoprecipitation, and on frozen sections. Engagement of CD200R by CD200 delivers inhibitory signals to the CD200R bearing cells. This interaction is important for the modulation of the activation of cells in the myeloid lineage. In this role it, for example, functions to maintain homeostasis in the lung by regulating alveolar macrophages. To view our comprehensive range of antibodies against surface markers and makers relevant to your research in innate immunology use our search engine.